When you are designing a pattern it helps if you use a grid with boxes which are wider than they are tall as it gives a truer picture of what the knitted design will look like (a 10 cm / 4 inch tension square knitted in stocking stitch will normally have more rows than stitches). You can use regular squared paper, but if you do you need to bear in mind that when knitted the design will look shorter and wider than it does on paper. There are a number of internet sites which allow you to download knitters’ graph paper free of charge. This one enables you to create graph paper to your own gauge (i.e. stitches / rows per centimetre or inch): http://www.tata-tatao.to/knit/matrix/e-index.html. It creates a pdf document which you have to print off to use. You can also create a grid using a computer spreadsheet programme, or a table in a word processing application. Using a programme specifically designed for creating knitting charts is even better as the symbols have already been created for you. 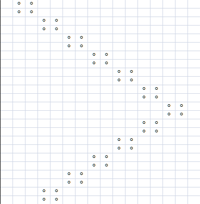 A gansey pattern chart is generally designed so that the knitter starts in the bottom right hand corner and works along the bottom row first, then works subsequent rounds or rows in sequence. 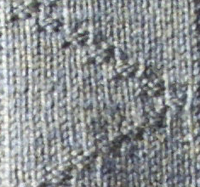 Stitches which appear as plain knit stitches on the right side of the garment are generally represented by blank boxes.